In what is probably the most damning report ever issued by a Canadian auditor general, Sheila Fraser has in effect accused federal officials in the Department of Justice of lying to Parliament about the true cost of the firearms registry. Her report, released on December 3, charges: "The issue here is not gun control. And it's not even astronomical cost overruns, although those are serious. What's really inexcusable is that Parliament was kept in the dark." The auditor general continues: "I question why the department continued to watch the costs escalate without informing Parliament and without considering the alternatives." Justice bureaucrats were apparently working to keep the full picture from the auditor general, as well. "We stopped our audit when an initial review indicated that there were significant shortcomings in the information provided," Ms. Fraser says. "We concluded that the information does not fairly present the cost of the program to the government." Even so, the cost overruns for taxpayers were, in her words, "astronomical," amounting to as much as 400 times the original estimate for licensing Canada's firearms. In 1995, when the gun registry was proposed, the estimated cost was $119 million. Of that total, $117 million was scheduled to come from licensing fees, and just $2 million from taxpayers. But through her partial audit, Ms. Fraser estimates the registry will have cost more than $1 billion by the end of the next fiscal year, while the government will have collected only $140 million in licensing fees. It remains unclear what all that money has been spent on. One definite fact: $227 million was spent developing the computer database that stores registration information. In addition, the central office in Miramichi, N.B., which employs 100 people to process applications, cost $60 million to set up. Another $61 million went into advertising the registration initiative. 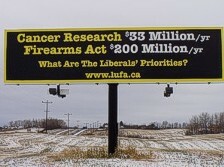 The auditor general's report was no surprise to Garry Breitkreuz, Justice and firearms critic for the Canadian Alliance. Thanks to more than 300 access-to-information requests, he gleaned enough data to predict as early as 2000 that the registry was going to cost in excess of $1 billion. Mr. Breitkreuz has now asked for an investigation by the Speaker of the House of Commons into wrongdoing in the Justice Department. 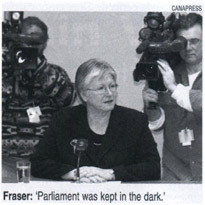 "The auditor general said these officials 'kept Parliament in the dark.' That means we can't do our job as official opposition, and the media can't report properly. Democracy is slapped in the face because people can't make an informed vote," he charges. The mainstream media itself is partly to blame for missing the truth for so long, Mr. Breitkreuz believes, since he had been supplying them with evidence of governmental bungling on the issue for years. "They believed the Liberals when they called it 'gun control.' But it is not. It is bureaucratic paper-shuffling. They need to investigate a little more deeply." The billion bucks, notes the Saskatchewan MP, is a lot more than a paper loss. "That [money] could have purchased and staffed 238 MRI [magnetic resonance imaging] machines for Canadian hospitals, or put 12,000 police officers on the streets to go after violent crime. Instead we have bureaucrats sitting behind desks. The Liberals want to appear compassionate, but what would have been more compassionate?" The articles report that the Justice Department lied to and misled Parliament to cover up that the costs of the gun control registry, initially estimated to cost the taxpayers no more than $2 million, escalated to hundreds of times the original estimate. The facts of the cost over-runs were known to many and were publicized from the very start, years ago, but not in the major media. The articles identify that, too, and heavily blame the Justice Department for all of the fiasco. However, the articles leave a couple of questions unasked. How was it possible that Parliament let the Justice Department get out of control, and how can it be that, time-and-again, the voters put back into office MPs who appear bent on wrecking Canada and our well-being? By the way, I know of quite a few people who've registered their firearms  law-abiding citizens they are  and who tried for months to get their licenses renewed, without success. They just can't get through to anyone, but, being the good citizens they are, they keep persevering in the face of a government bureaucracy mired up to its neck in who knows what. As Jim Hinter, president of the National Firearms Association reports, months-long and futile waiting periods are experienced also by anyone trying to register for the first time. Nevertheless, just this morning we saw another announcement on Global News telling us that anyone who has not yet registered his firearms and is kind enough to phone or write no later than December 31st will not be criminally prosecuted. Well, it won't cost you anything to try, other than your time and perhaps ultimately your freedom and good reputation. However, at the very least it will prove that the government ad-campaign is working, even if nothing else is. That should be enough to make anyone feel good. It's a good thing we can still buy our groceries on our own. I sure wouldn't want to trust the government with that. It would most certainly mess that up, too  look what it did to the health care system! However, you can rest assured if you are still a believer who wants to feel good. As a spokesman from the Firearms Registration Centre stated on the news this morning, the cost overruns should "diminish somewhat as soon as all of the data required have been collected" (or perhaps when hell freezes over, whichever comes later). Isn't that great? Oh, what a good government we have.